I love outerwear. I admit I have a semi-ridiculous number of jackets and coats — but I love them all! It’s fun to have a variety of colors, fabrics, cuts and weights. Some days call for my heavy-duty, knee-length wool coat from Victoria’s Secret. Others may require a simple lightweight khaki trench. And when an outfit calls for a pop of something different, I pull out my thrift-store, grey leather coat. Needing some of color? I grab my green, satin swing coat, complete with a funky, gold zipper. If you’re 2005 winter coat is finally reaching its expiration — or if your wardrobe generally needs more variety — now is the PERFECT time to go outerwear hunting. Around late January and early February, retailers start significantly marking down heavy coats, jackets and other outerwear to make room for spring and summer styles and cuts. So next time you’re in the neighborhood of Old Navy, Ross, TJ Maxx, Target or other, swing by and see what kind of deal you can score. 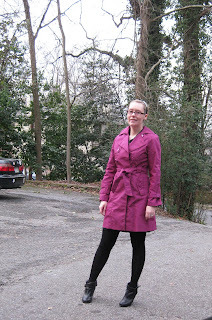 Coat pictured here: my new Nine West Fuchsia lightweight trench. I found it at Ross in Raleigh, North Carolina, last weekend for $25 (retailed pre-Ross for $200). Ignore the face – my makeup hadn’t yet found its way to my face this morning. This week, Becca e-mailed me a question. I had so much fun answering it! Hey, I stumbled upon your blog through other people's blogs. I just wanted to say I really love reading your blogs and your findings. I was just wondering, which thrift stores do you hit to find vintage jewelry. I live in the atlanta area also. Any information would be great. Thank you so much. I'm so flattered you enjoy my blog and reached out to me! While they don't have hoards of jewelry, I have found many affordable and unique vintage jewelry pieces at Kudzu Antique Market (http://kudzuantiques.com/) in Decatur. Not to mention they have great sales (sign up for their e-mail newsletters). Another great place to look is My Sister's Closet: http://www.mysistersclosetonline.com/. I haven't been there, but I've heard great things about Back by Popular Demand in Lilburn: http://bbpdconsignment.com/. p.s. I wouldn't have known about Back by Popular Demand if it weren't for the lovely Danielle from Fell4Fashion. Thanks, Danielle! 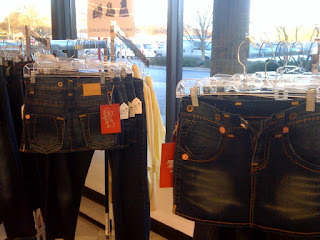 Spotted today at the Northlake Goodwill (LaVista Road in Tucker http://rockandrepublic.com/)... about 12 Rock-N-Republic denim skirts WITH TAGS! The skirts, which looked to range from size 25 to 30, were marked $25. Two blankets into my volunteer work (sewing baby blankets for Grady Hospital babies), my sewing machine broke. If this isn't annoying enough, I JUST got it serviced (I'm talking days ago) and I have to sew the hems on 33 blankets before February 8! I am brainstorming creative ways to get to the repair shop... which is only open from 9 to 5:30 and is located on the opposite side of town from my office. Ugh. 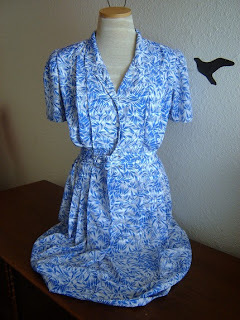 Anyway, since I was feeling crafty tonight, I'll pick up a little project I'd been putting off — putting new buttons on the Maggy London shirt dress I bought back in November at Last Chance (a local thrift store). S/M dress seen here for $22. Oooh. And I love this funky/fem silk 80s one, too (also on Etsy). 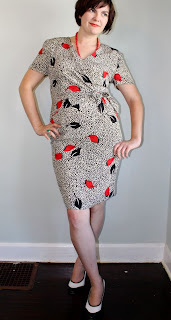 Size 12 Maggy London dress seen here for $48. I think being able to wear my new-to-me Maggy London dress tomorrow is enough to make me forget about this sewing machine debacle for just a bit. Today, I received this 25% off e-mail coupon for That Pottery Place -- so I thought I should share! That Pottery Place makes for a fun evening with the girlfriends (bring your own wine and some sandwiches, perhaps) or a fun Saturday outing with the kiddos. It's been too long since I've been buy to paint something fun... so maybe you'll see me there! Wear size 26, 27 or 28 jeans? Have a penchant for designer jeans but too broke to support your habit? Run as fast as you can to the Northlake Goodwill (LaVista Road in Tucker - near 285). 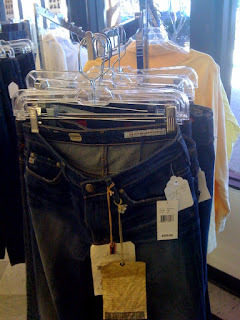 I found a whole rack of designer jeans yesterday... with. the. tags. still. on! It looks as though a high-end boutique went out of business and had to liquidate its inventory. 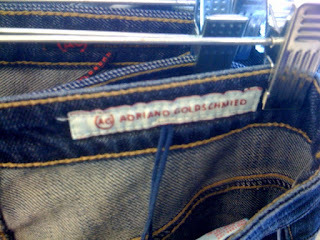 Many of the pairs were Adriano Goldschmied. 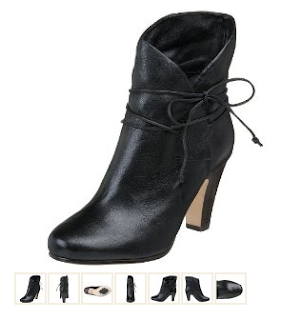 These retail for $165-plus at Nordstrom and Neiman Marcus. Twenty-five bucks is a killer deal! Sorry for the bad iPhone photo. Premium denim at the Good-Willy for $25 (front of the store). Too bad the vintage Halston blouse I found was a size 10 and smelled like a carton of Virginia Slims. Booo! One of my New Year's resolutions is encouraging more people to buy secondhand. There are SO many reasons to consider shopping your local Goodwill, Salvation Army or vintage boutique. THERE'S SERIOUS FUN IN THE HUNT! Okay, more on that later. For now, here's an example of what's waiting for you at your local secondhand shop. Cliff Bostock, lover/reviewer of food (and sometimes all-things-ridiculous) found one of my iPhone Kroger snapshots rather intriguing. 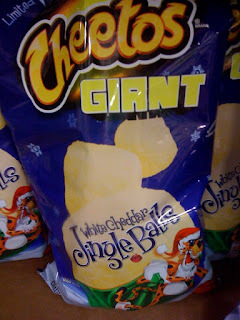 Cliff's posted a little diddly under the "bad packaging of the week" category on the Creative Loafing "Omnivore Atlanta" food blog. (See the silly post he wrote to accompany the photo here). See my 'lil Antico review here. If you haven't been yet, go! I'm talking drop whatever you're doing and GO NOW! So, I've tried wearing my $24.99 H&M winter shorts twice now. The first time, I wasn't brave enough to venture out wearing them. The second time, I managed to wear them to a small gathering at a friend's house. The other components: black tights (Target), black Dolce Vita booties (now marked down to about $125), white Target tee, random black/white/grey slouchy sweater from Ross. I must admit that wearing these shorts is a little stressful! I'm not usually one to wear shorts (even in the summer), nor show a lot of skin in no matter what I'm wearing. I think I'll feel more confident if I wear them with opaque black tights next time. 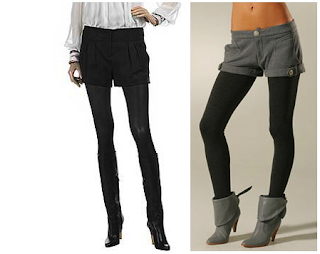 Winter Shorts: What's the Verdict? Winter shorts... love them or hate them? You know, those cuffed shorts (often wool, houndstooth, checkered, etc.) that you've been seeing a lot of lately. I bought a black pair from H & M recently and am currently trying to decide how to wear them. Ideas? Thanks to everyone who helped me figure out what to wear on New Year's Eve (gah, it was so tough!) . The sparkly off-white top and black skirt ended up being great choices for our little shindig — not to mention I'll eventually get to wear that purple vintage getup for another occasion (with a little tailoring in the top, of course). Boots from Endless - now $136 (free shipping). They're even cuter with the tops folded/cuffed. Also, thanks to Raging Burrito and Raging Taco (Decatur Square) for allowing us to host a party in their space again this year. We appreciate it, Laura and Scott!